Somebody really needs to teach Helvetica the Mystery Science Theater 3000 mantra. Hey! In other news, this is an announcement that hereon, Helvetica updates will be pushed to every Saturday! My schedule recently underwent a pretty intense change, so this was necessary for me. Thanks for reading!! So I pointed this out to my brother, who pointed out to me that Fedora and Trilby technically have PENCIL thin mustaches. Think about it…. Look out, he’s got Sproutella! What is dead can never die, but rises again harder and stronger. Hey, so I read all the archive today and I already LOVE this webcomic! You’ve done a great job with all this misteries, the detectivesc feeling that the comic has… Your art is beautifull too, and the chatacters are awesome! Hope someday you can expand your updates to 2 days a week. Congrats for this! Silence will fall when the question is asked. On the Fields of Trenzalore, at the fall of the Eleventh, when no living creature can speak falsely or fail to answer, a question will be asked — a question that must never ever be answered. The first question. The oldest question in the universe, hidden in plain sight. Would you like to know what it is? Helvetica surely actually wonders this question…but I like to think he’s asking it shrewdly as an attempt to stall for time. Yeah, I’m an optimist, leave me alone! He’s so fresh-dead that’s cute! BUT WAIT! What if there’s another afterlife after the afterlife!? And another after life after the after after life! After all, who guessed that the first after life would come after life? If you die here, you’ll wake up with no memory of your past, very little cognitive ability, and other people choose your name for you. And you’re also this gross squishy thing with a bunch of fluids and… SKIN. IS THIS WHAT YOU WANT, VET? IS THIS WHAT YOU WANT??? i see what u did there…. The MST3K mantra? You mean, “Just repeat to yourself: ‘It’s just a show, you should really just relax.'”? I asked the same thing as soon as I saw the gun lol. 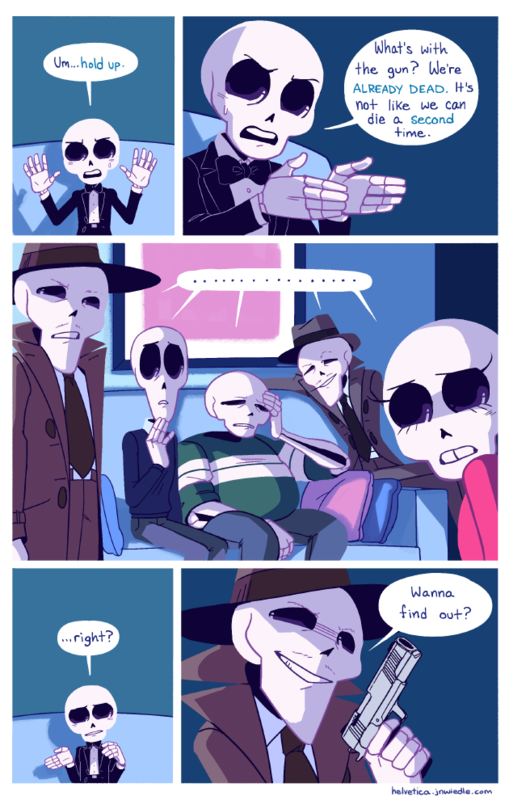 wait, so, they’re just skeletons, right? no organs or anything. wouldn’t that mean that shooting them in the skull would be no more effective than shooting them in the humerous?